They were right. As the men (top row, left to right: Joseph C. Garcia, Randy Ethan Halprin, Larry Jame Harper, and Patrick Henry Murphy, Jr.; bottom row, left to right: Donald Keith Newbury, George Rivas, and Michael Anthony Rodriguez) were robbing a sporting-goods store in suburban Dallas on Christmas Eve, they were interrupted by a police officer named Aubrey Hawkins. He died after being shot 11 times by the desperate group, who also ran him over as they fled. After an America’s Most Wanted segment showcasing the fugitives was aired in January 2001, a tip led to the capture of gang ringleader Rivas and three of the other men. (They were hiding out in a Colorado trailer park, somehow passing themselves off as Christian missionaries.) Harper committed suicide before he could be taken into custody. The remaining two escapees were nabbed days later at a Colorado hotel, surrendering after brokering a deal that allowed them to first give TV interviews decrying Texas’ justice system. 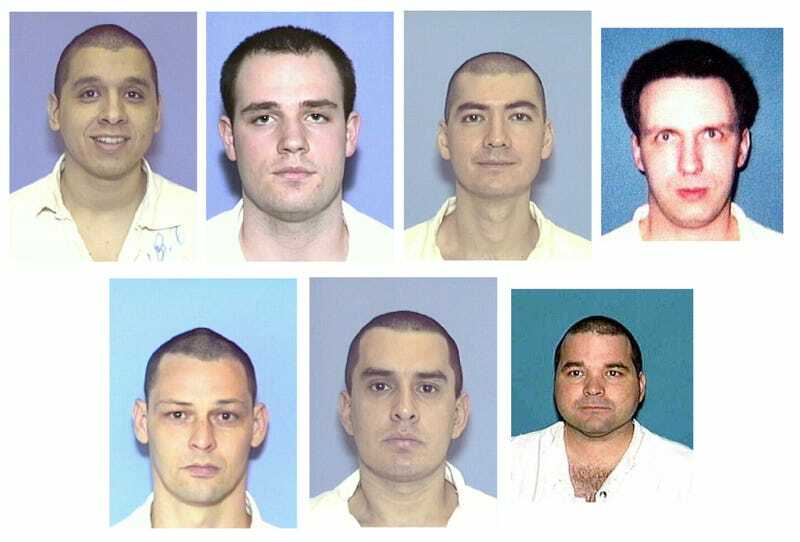 All of the surviving six received the death penalty for their actions. To date, three have been executed, with the most recent, Newbury, dying by lethal injection this past February.